Before you continue, it is worth knowing that there is also a convenient limousine bus service that can bring you directly from Incheon Airport to Myeongdong at the fare of only KRW15,000 per person. If you want to go from Incheon International Airport to Myeongdong, the flat rate fare starts from 65,000 won for normal size international taxi carrying maximum 3 passengers. If you have four or more passengers, choose Klook Airport Car or Van Transfer. 4-5 people - definitely take Klook Airport CAR Transfer (KRW78000 / 4 = KRW19500 per person, only slightly more expensive than the price of taking bus 6015, plus arrive at the door step of you hotel). 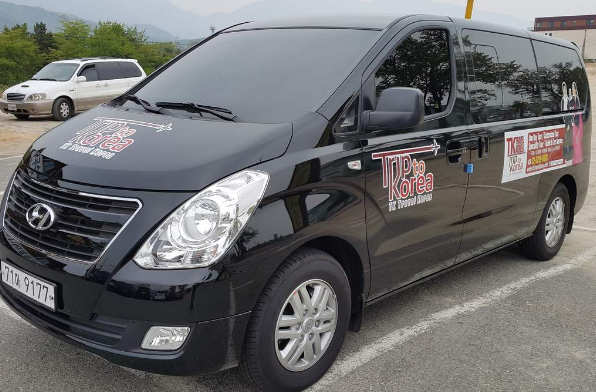 7 people - definitely take Klook Airport VAN Transfer (KRW90000 / 7 = KRW12,857 per person, CHEAPER than the price of taking bus 6015, plus arrive at the door step of you hotel). For travellers who want comfort, convenience and certainty, International Taxi and Klook Airport Van Transfer is still the best choice to go from Incheon International Airport to the door step of your hotel / destination in Myeongdong or anywhere in downtown Seoul. 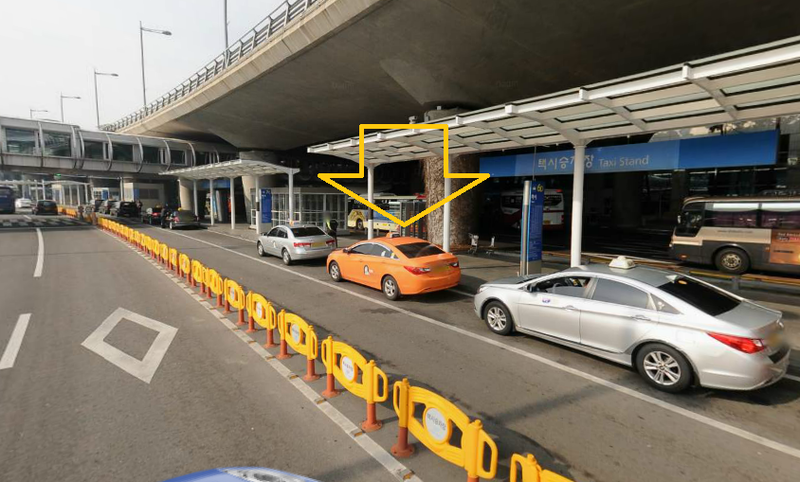 For many foreigners arriving in Seoul, International Taxi Service and Klook Van Transfer are the favourite type of taxi/transfer service to take at Incheon International Airport. These two services have two advantages. Firstly, unlike other normal taxi drivers, the drivers for International taxi and Klook Airport Transfer service can at least understand and speak basic English. Secondly, the rates or fares for international taxi and Klook Airport Transfer are fixed at flat prices. Therefore, you do not have to worry about traffic jam unlike the normal taxi drivers who are using meters. Best of all, this flat rates or fares are not more expensive compared to other Seoul taxis using meters. If you decide to take International Taxi, there are two international taxi counters where you can hire a taxi to Myeongdong upon arriving at Incheon International Airport. The first counter is located between exit Gates 4 and Gate 5 in the arrival hall (Desk No 23) and the second counter is locted between exit Gates 8 and Gate 9 in the arrival hall (Desk No 46). 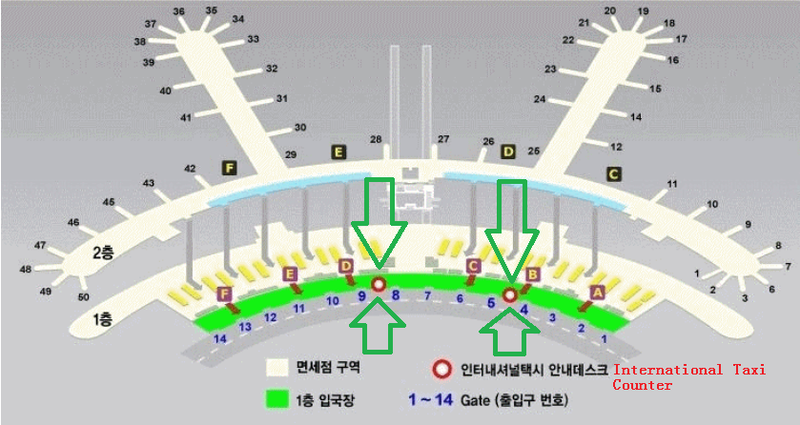 Two International Taxi Counters Located at the Arrival Hall of Incheon Airport, one between Gate 8 and 9 and another one between Gate 4 and 5. Just approach the friendly staff at any of these counters to tell them that you want to hire an international taxi to Myeongdong (or give them the exact hotel or destination name). If you choose to use Klook Airport Transfer service from Incheon Airport to Myeongdong (or any downtown Seoul destination), you will need to make your reservation online for Airport Van Transfer Service. The driver will hold a Klook flag and wait for you during your arrival date and time at Incheon Airport arrival hall and lead you to the Airport transfer van. How Many Passengers can a Taxi Carry from Incheon Airport to Myeongdong, Seoul? For international taxi, you can choose between Medium Taxi or Luxury Taxi. Medium Taxi can carry 3 adult passengers and 2 to 3 luggages depending on size. Luxury Taxi is a luxury car with more comfort and space for 3 passengers and 4 luggages. Large Taxi can carry up to 7 adult passengers and 7 luggages. The staff at the taxi counter will determine the taxi fare based on the zone of your destination and the type of taxi you choose. In case of Myeongdong, which is located in Jongno (Zone B), the flat taxi fare is KRW65,000 for Medium Taxi. 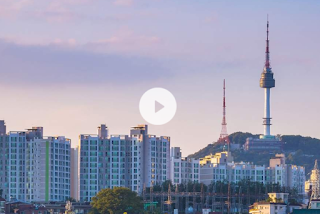 These taxi fares from Incheon Airport to Myeongdong or destinations in downtown Seoul are not expensive if shared among a few travellers in a group. Using taxi can also save you quite a fair bit of walking and pulling your heavy baggage compared to using airport limousine bus or AREX train. Like hiring an Airport Tranfer service, the international taxi driver will come to the taxi counter and help to take your baggage and lead your to the taxi without you having to figure out the direction to the taxi stand. You will also get a taxi card with the driver's name taxi registration number for your safety and record. Similarly, you can also take international taxi or Klook Airport Transfer from your hotel in Myeongdong to Incheon Airport on your way back. Most tourists staying in Myeongdong favour this option because they usually have heavy luggages to carry after their shopping sprees in Myeongdong. 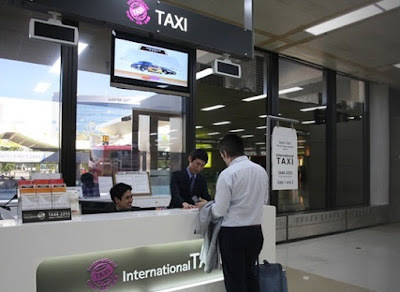 The return taxi fare from your hotel in Myeongdong to Incheon International Airport is similar to the taxi fare from the airport, which is around 65,000won to 95,000won depending on the types of taxi you hire. The return Klook Airport Transfer fare from your hotehttps://goo.gl/lwzGYYl in Myeongdong is 78000won for a 7 seater van. If you are worried about not being able to get a taxi or Klook Airport Transfer service in time catch your flight at Incheon Airport, you can also book your international taxi or Klook Airport Transfer service in advance to pick you up at the hotel with no extra charge. Booking must be done at least 24 hours before departure. Reservation for international taxi can be made by calling telephone number +82-1644-2255 (drop +82 when call inside Korea) or email to reserve @ intltaxi . co . kr or visit h t t p : / / intltaxi . co . kr / Home / book. Please note that reservation office only operate from 9.00am to 6.00pm from Monday to Friday and 9.00am to 1.00pm on Saturday. The office is closed on Sunday and Korean public holidays. On the other hand, reservation for Airport Van Transfer Service can be done any time online but at least 2 to 3 days before your departure from Myeongdong especially during holiday seasons. 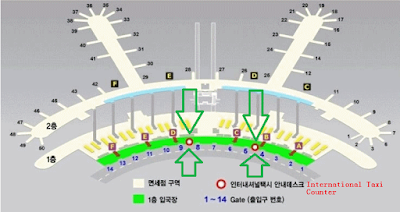 Should You Choose Taxi, Shuttle Bus or Train to go from Incheon Airport to Myeongdong / Downtown Seoul? Myeongdong is a popular place to stay for tourists and travellers to Seoul because not only there are shopping streets, street food and the famous Nanta Show here, but also you can take direct buses to go to Everland and Nami Island from here. Limousine bus 6015 can take you directly from Incheon Airport to many popular hotels in Myeongdong at only 15,000won. The disadvantage is that you have to walk from the bus stop to the hotel compared to taxi. This can be a bit adventurous and difficult especially if you are travelling with elderly, kids or have large and heavy baggages. On the other hand, if you choose to take AREX train from Incheon Airport to Seoul Station and then take LINE 4 subway to Myeongdong Station, the total fare is only 9,250won. Taking train is slightly cheaper than bus but it requires more walking when you change line at Seoul Station and to get to the ground when you arrive at Myeongdong subway station. Of course, taking taxi or Airport Transfer Service from Incheon International Airport directly to Myeongdong is easiest and most comfortable way of transportation. Needless to say, the rates or fares are more expensive compared to taking shuttle bus 6015 or AREX train to Myeongdong. However, if you want more comfort and less hassle, taking taxi or airport transfer service is still the preferred and worthwhile way of transportation to get from Incheon International Airport to Myeongdong and downtown Seoul, especially if you are travelling with family or small group. Hi, I am travelling with my old parents who are in their 70s. We are staying at Tmark Grand Hotel Myeongdong...is it a convenient hotel and location for us to move around without much problems? Yes, TMark Grand Hotel Myeongdong is near to Hoehyeon Station if you plan to use subway in Seoul (although subway may involve some walking too). This area also have a lot of shops and restaurants. Hi, I am looking at the train map from Airport to Hoehyeon Station(Tmark Grand Hotel)that it needs to switch train from Airport line to Light blue line at Seoul, may I know whether there is a linkway to walk or we have to get out the station? is there straight flat lane or elevators? or do we need to clim up or down any staircase? We are couple with 2 boys of 8 years old. Yes, there is a special walk way from AREX airport train arrival to LINE 4 platform to go Heohyeon (walking about 5 minutes). 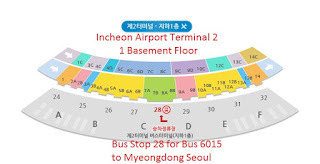 If you want to avoid the hassle of changing train line at Seoul Station, you can take bus 6001 at Incheon Airport that will bring you direction Hoehyeon Station. You need to alight alight at Namdaemun Market (Hoehyeon Station) bus stop. Bus ticket KRW15000 can be bought at arrival hall. *We recommend Klook Travel https://goo.gl/5rvMT3 for online booking of local tours from Myeongdong to Nami Island & Everland and tickets to N Seoul Tower, Nanta Show and Lotte World. Thank you for sharing info on airport transfer. Thanks in advance Chicken Share ! Hi! I'm travelling alone to go to myeongdong and I'm planning to go by taxi. Is there any chance that I can share it with other passenger? How much is the cost? Hi, followed your advice, I have just checked for Klook's Airport pick up van service for group of 6pp. The charges will be KRW90,000 equal to bus fare ticket for 6pp. Besides, once I open up the transaction to book, I see there is clause of Night rates charges from 10pm-08am. Could you pls indicate these rates in details because our flight will be landed at 05:30am? Thanks for your help!